A totally impractical guide to living and traveling in China (and bits of the rest of the world) from someone who has been doing it far too long for convincing sanity. 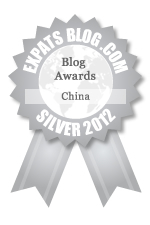 ExpatsBlog.com Expat Blog Awards 2012: China Silver Award! She sends me delicious astral food - need I a better reason? Full of insight, yet funny. Killer combo. It may be totally impractical, but this is also a totally fabulous blog. Cats, mops, food and - most importantly - great storytelling. I love it. Practicality is overrated. Love MaryAnne's blog(s)! Totally Impractical Guide is the caffeine to my mornings, the rhythm to my day. Big Love for the Win! These postings are simply fabulous - engaging, entertaining, witty, thoughtful, articulate, and just plain readable.